Select USB connection mode to "UMS mode only"
First enable USB debugging by going to Settings -> Applications -> Development -> enable "USB debugging". Plug in the USB cable from the computer to the phone. 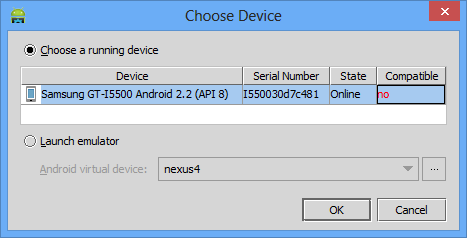 The phone will pop up the "Setting USB" dialog and ask you to select "KIES" or "UMS mode only". You want to select the first option: UMS mode only. (Kies is Samsung's software for updating the phone's software etc). I modified the build.gradle file to minSdkVersion 8 and also set android:minSdkVersion="8" in the AndroidManifest.xml file. Now the app deploys OK.